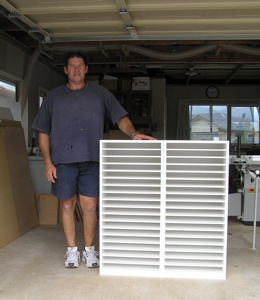 Grant and Annmarie started Fun Furniture at the beginning of 2011 after seeing there was a demand for quality craft storage furniture and tables. With Annmarie already involved in her mother's scrapbooking shop, Paperzone, it wasn't long before she and Grant, a cabinetmaker by trade, started drawing up plans for the Fun Furniture range. Based on a series of stackable cubes that can be added to as required, the Fun Furniture system quickly took off and soon became the "must have" item of scrapbookers and craft enthusiasts around the country. Quality, functionality and style are the essential elements that make this range so popular and a worthwhile investment.